The purpose of the present investigation is to formulate and evaluate an antifungal nail lacquer for treatment of onychomycosis. A nail lacquer will be formulated, consisting of antifungal drug Miconazole nitrate, film forming polymers like nitrocellulose, plasticizer like propylene glycol and other required additives. An attempt will be done to enhance the transungual drug permeation of Miconazole nitrate using various permeation enhancers. R. Manavalan*, Barish, E. Abraham Theodore, Aswanivm, R. Venkatanarayanan. There are various carriers in the field of pharmaceutical science and some of the drug carriers reached the stages of clinical trials where liposome shows the effective drug delivery to the targated site. These are vesicular concentric structures with a range in size from a nanometer to several micrometers a phospholipids bilayer and are biocompatible, biodegradable and non immunogenic. Drug enclosed in liposomes include Doxorubin, Cisplatin, Vincristin, Melphalan, Sarcolycin, Daunorubicin, Etoposide etc. The liposomes loaded drugs can be administrated by various routes like i.v, oral, in local application, ophthalmic etc. And are used for treatment of various disease cancer, rheumatoid arthritis, Fungal infections, tropical parasites, bacterial infections, Cardiovascular diseases, Darmetology, gene therapy etc. Now a days pharmaceutical science have vary demand of liposomes to reduce various problems like toxicity, poor solubility, short half life and poor bioavailability and other strong side effect of various important drugs can be over thrown by employing the idea of liposomes in various diseases like cancer etc. Liposomes offer ample opportunities for the explorer to explore the unidentified development in the field of pharmaceutical technology. Juti Rani Devi* and Bidyut Das. The study is concerned with the preparation of Ethyl cellulose microspheres of Diclofenac sodium using different drug: polymer ratios by an emulsification solvent evaporation method in presence of Tween 80 as an emulsifying agent and the influence of process parameters such as solvent mixture, composition, concentration of an emulsifying agent and stirring speed has been examined. The microspheres have been analyzed for their size, drug loading capacity and drug release study. The percentage yield is found between 75.34±0.94 % to 80.34±0.86 % in all formulations. Use of acetone in the oil phase drastically reduced the particle size. Spherical and smooth surfaced microspheres with desired encapsulation efficiencies were obtained. The drug-loaded microspheres (F-I to F-VI) showed the entrapment efficiency of 58.93±0.35 % to 90.47±0.93 % and shown retarded drug release observed up to 8hrs using phosphate buffer (pH 6.8). All formulated batches indicate compliance with Higuchi’s plot and reveals that the drug release followed first order release kinetics. Stability study of best batch showed good results with no-observable physical changes. It could be conclude that the prepared microspheres were shown satisfactory results and suitable for potential therapeutic uses. R. Nethaji*, Shanub P, P. Manikandan, N.S. Surendiran, G. Babu. Nano technology is a magical word among the world community nowadays. This emerging science over rule’s almost all departments like information technology, Civil engineering, Medical system etc. in technological applications. Recent developments in Nano Medical technology are helpful in the diagnosis and treatment aspects of certain life threatening diseases like Cancer and other diseases in cellular level. Siddha system of medicine is one of the oldest traditional systems in the world. This system exists in South India especially in Tamilnadu. Siddha system is an old age medicinal heritage established by Siddhars who are supernatural sages. Varmam, Alchemistry, Yogic practices are the some of unique specialties in Siddha system. Concepts of various technologies of recent sciences like Biotechnology, Nano technology; Biochemistry, Pharmacology, etc. are found abundantly in Siddha system. 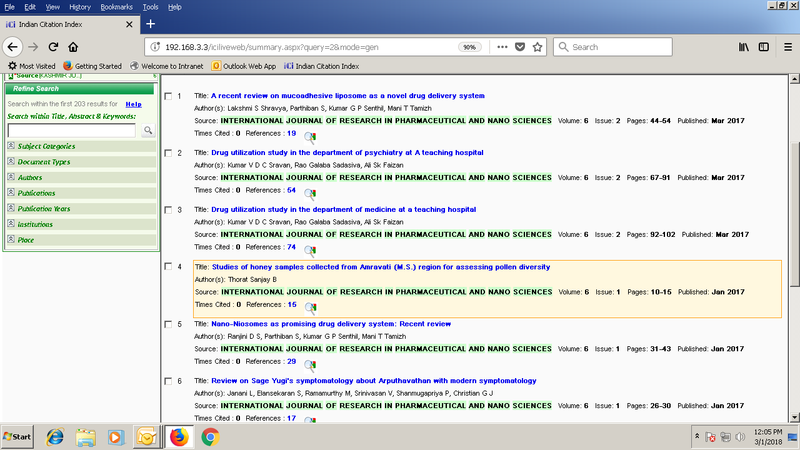 This Article explains about Concepts of nano technology in Siddha medicinal pharmacology with Siddha literature references. R. Manickavasagam* and C. Senthamil Rajam.